Screening children more likely to detect hip dysplasia. According to statistics, is a common disease found in every seventh child. With 80% of cases occur in girls. Dysplasia, is not cured until one year of age, eventually leads to disability. Detection of pathology before the age of 1 month of life leads to a complete cure of the disease. However, the possibility of recognition of the disease in newborns are limited and require experience doctor. So hardware diagnostics are crucial for the outcome of the disease. 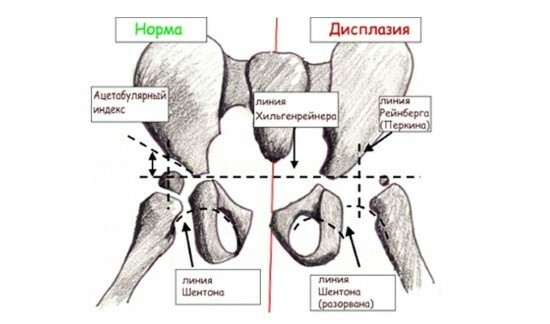 In Russia x-ray of the hip joint is a mandatory method of confirmation or exclusion of disease. Let’s find out what age do x-rays of the joint children. As seen on the image in normal and dysplasia. What alternative methods of examination exist. Will sort out all these issues. X-rays of the hip babies do in the supine position. In this case the baby’s legs straighten and pull along. It is unacceptable that they were bent at the knees or hip joints. Radiography of newborn children is characterized in that the legs are to the body and angled slightly inward. When tightly pressed against the pelvis to tape the movement of the baby do not interfere during shooting. The genital area close a lead apron to prevent reproductive disorders. To ensure the quality of the image, ideally the baby should be put to sleep before the session. Normal in the picture, the doctor visualizes the head of the femur, which is located in a special recess – acetabulum. The head of the femur is attached in the center of the round ligament to the acetabulum and is retained capsule. At the top of the head does not shift the cartilaginous plate limbus. The design of the joint is supported by muscles of the thigh. With hip dysplasia there is a delay in the development of points of ossification. In this nucleus of ossification are characterized by smaller size and slow growth. On the radiograph when subluxation or dislocation visualize the vertical and lateral displacement of the nuclei of ossification. In children in the norm of points of ossification in girls, appear in 4 months, and boys at 6 months of age. Dislocation or subluxation occurs during the birth. The reason is that a large part of the joint consists of cartilage, which do not provide for full conformity of the articular surfaces to each other. A large femoral head does not match the size of the depression. Therefore during labor there is a shift of the head in the acetabulum. In some cases, the dislocation leads to rupture of the tissues of the thigh. According to the Russian health standards radiography is permitted for children from 3 months of age. In the neonatal period safe and accurate diagnosis using ultrasound. In exceptional cases, an x-ray is allowed at any age. some older x-ray equipment is manufactured with a standard power do not allow to adjust the radiation dose for children. X-ray is contraindicated in children suffering from immune deficiency due to bone marrow suppression. Contraindicated x-ray of child suffering from juvenile idiopathic osteoporosis. For other categories of patients with suspected dysplasia, the x-ray is required the standard method of examination. On radiographs in infants a large part of tissue is not visible because it consists of cartilage. Therefore, to facilitate decoding use the scheme of Hillenmeyer. She received practical application due to the reliability of the interpretation of the image. The vertical line conducted through the middle of the sacrum. The horizontal line of Hillenmeyer passes through the bottom edges of the iliac bones, which are well visualized on x-ray. These large bones form a cavity for the hip joints. Through verhnekamye edge of the Ilium, lower the perpendicular – line Perkin. Along the edges of the acetabulum to a horizontal segment is carried out in the tangent line. The resulting angle is called the acetabular, or angle of the roof of the acetabulum. According to some authors he is called angle alpha. In normal newborns, the angle (α) of inclination of the roof of the acetabulum 25-29°. at the age of 5 – < 15°. The increase in tilt angle shows the backwardness of ossification, which means the degree of glenoid dysplasia. In the diagnosis of hip dysplasia has the value of the index h is the distance from the horizontal line to mid-thigh. Normal h=9-12 mm. Reduction value indicates dysplasia. In addition, determine the value d is the distance from the acetabulum to h. On a normal picture it is 15 mm. the Decoding of the picture makes orthopedist or radiologist. Gentle method of diagnosis of the hip joint in children is an ultrasound. Ultrasonic diagnostic screening of all newborns in the hospital to identify dysplasia is being promoted around the world. Since 1992, it began to spread in Europe, and since 2007 it is held in Russia. If diagnostic screening was not carried out in the hospital, it is recommended to do this at the age of 1 month to identify dysplasia. The need for ultrasound in this age dictate risk factors – breech baby or illness of the mother. Summing up the topic, we will remind, for the detection of advanced disease dysplasia x-raying of the hip joint. 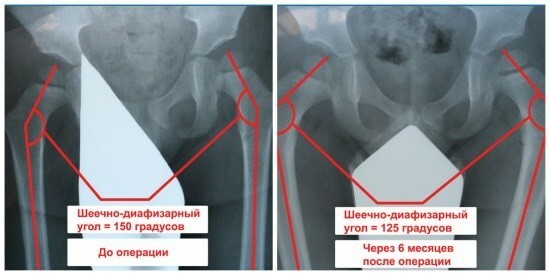 According to Russian standards in medicine x-rays can be done in 3 months. However, for disease outcome early diagnosis is important to 1 months of age of life. Therefore, if the risk factors it is recommended to do a newborn ultrasound of the joint. In other situations, children from the age of three doing an x-ray to detect dysplasia. Norma leukocytes in the blood of children: what determines.